Twelve essays that explore the role of the Texas Press Association in informing the electorate, promoting business, advancing the public good, and improving the quality of life for all Texans. From the days when printed newspapers were a rare commodity to the era of the Internet and mass communications, Texas newspapers have provided a provocative and critical look at the history of the Lone Star State. Newspapers are often called the "first drafts of history." 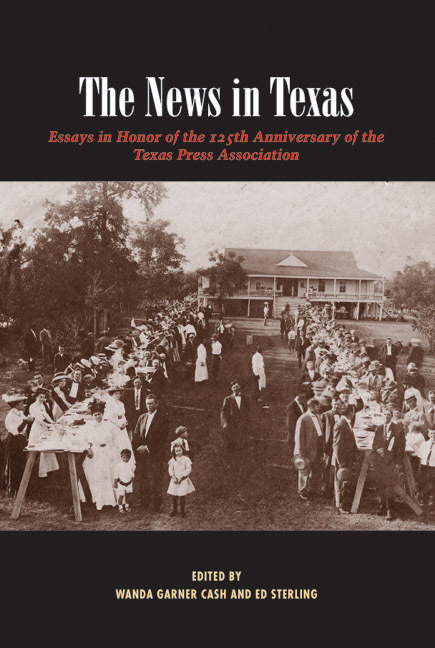 In honor of the 125th anniversary of the Texas Press Association, a group of outstanding authors and columnists has contributed essays on the changing face of the state, its people, and its landscape. This book includes articles that reflect the variety and color of the daily newspaper—all with a Texas twist. Edited by Texas journalists Wanda Cash and Ed Sterling, The News in Texas recounts the stories of courageous publishers who used their columns to challenge inequities and injustices. Essays discuss the challenges that faced the earliest Texas publishers of the nineteenth century and how women overcame the male-dominated newsrooms and executive offices. In the 1930s, Texas newspapers created the mania for the Texas Centennial and forever altered the image of the state. Humor, crime, business, entertainment, sports, controversy—all appear in this lively collection of accounts about the newspapers and the men and women who provided the news. The book also includes Texas Pulitzer Prize winners and information on the history of the Texas Press Association. Wanda Garner Cash is editor and publisher of the Baytown Sun . A community newspaper veteran with more than twenty-five years' experience, she has also worked at the Brazosport Facts, Galveston County Daily News, Kerrville Times, and Ingram News (of which she was owner, editor, and publisher). Ed Sterling is Director of Member Services for the Texas Press Association in Austin. He has worked for the Canyon News, Tulia Herald, Amarillo Globe-News , and Alpine Avalanche . The purpose of this book is to tell the story of the roots, progress, and dynamic effect of the Texas Press Association in the rambunctious and mettle-testing atmosphere of the Lone Star State. The book will focus on how individual newspaper publishers from disparate backgrounds have come together under the tent of their own trade association and worked collectively to develop an informed electorate, promote business, advance the public good, and improve the quality of life of all Texans. The association currently reports 508 member newspapers. This book is intended to fill a hole in Texas history where there should be a detailed account of the role of this association of editors and publishers from weekly, semiweekly, and small daily newspapers in the development of the state. As a natural outgrowth of their membership in the Texas Press Association, newspapermen and newspaperwomen essentially become family with their counterparts from cattle ranches and grasslands, cotton country, the oil patch, mineral troves, farmlands, citrus groves, and wilderness areas. The percolation of entrepreneurial synergies and the resulting actions made possible by their gathering at an annual convention began in 1880. This fraternity has been a catalyst in the progress and development of Texas ever since. The story of the Texas Press Association is also one of modernization through technological advances: "pony mail" and the telegraph gave way to the telephone; single-sheet presses and labor-intensive typography gave way to Linotypes and Babcock presses, then to cold type and web presses. Royal and Underwood typewriters and stuffy darkrooms were abandoned in favor of computers and cell phones. The Texas Press Association and its members lay a major claim to helping forge the myth of the independent Texan and reveling in the reality of it. The group's sweat equity in the state was readily seen in the drive to build the San Jacinto Monument, the construction of the state highway system, and the rallying of public opinion that brought about the designation and creation of Big Bend National Park. In 1936, at the nadir of the Great Depression, the press association took a leading role in the Texas Centennial celebration, working hard to convince the world that the citizens of Texas themselves are the heart of something unique and grand in scope. State leaders recognize the Texas Press Association's ability to influence public policy, mobilize voters, and keep Texans up-to-date on critical issues, from water and soil conservation to food rationing and scrap collection drives during World War II. Citizens and public servants find insight and guidance on the editorial pages of community newspapers. Even when newspapers take an unpopular stand on an issue, private citizens know their newspaper is on the job, reporting on items of interest to the community and serving as both watchdog and gadfly. In the masthead of most member newspapers is a small Texas Press Association logo. Readers learn that the logo symbolizes the fact that their newspaper is in pursuit of excellence in service to the community. They also come to understand that Texas Press Association aids its members on open-government and business issues and serves as their advocate in the halls of the state capitol. The press association, in concert with the Texas Daily Newspaper Association, fields a legislative advisory committee that scrutinizes legislation. The story of the Texas Press Association, furthermore, is the story of family and group ownership. Many families hold tight to newspapers founded by their pioneer ancestors, and in the twenty-first century, as in the twentieth, families buy out existing newspapers and establish new ones. From the Roberts family in the Texas Panhandle and South Plains to the Hartman and Walls families on the Gulf Coast, dozens of Texas newspapers have thrived under family ownership for generations. Corporate groups such as Harte-Hanks, the Hearst Corporation, Cox Communications, and Westward Communications have shepherded significant holdings of newspapers for decades. Despite strong and independent family and group ownership, the road to success and, indeed, survival is not and never has been a cakewalk for Texas newspapers. Thriving towns and their newspapers dry up after interstate highways are routed around them. The arrival of Wal-Mart in Texas communities takes a grievous toll as the retail giant drives out Main Street businesses. Environmental regulations and the wildly fluctuating price of newsprint and equipment makes back-shop printing presses increasingly rare, and new, regional printing presses absorb an increasing share of the presswork. Newspapers, in response to consumer demand, warm to the idea of paid online content to supplement their traditional print products. The Texas Press Association and its members live in the crucible of all that defines the Lone Star State. From its establishment in 1880 until the present day, the association and its members have served as watchdogs of freedom and agents of change in their communities, interpreting the key issues and events of our state on their front pages. Newspapers chronicle Texas history one issue at a time, reflecting and shaping the state's independent character. In this anthology, the personal reflections of the essayists enhance that chronicle. Given the popularity of all of the new media and communication technology, it would be logical to ask whether the tried-and-true newspaper is still relevant. It is, primarily because of such bodies as the Texas Press Association. This book examines the background of Texas newspapers and their grand place in history and coincides with the 125th anniversary of the Texas Press Association. The TPA now is primarily an organization of newspapers that serve the smaller communities in Texas's 254 counties. It had a tough time getting started. Some editors, conducting their businesses out of a cigar box, said finding the $2 for annual dues was tough. But the organization has prevailed, serving the people of Texas as well as the newspaper industry. Regardless of the size of the community they serve, newspapers have long been the driving force behind getting out the news, getting things done, and getting things corrected for Texans. Newspapers still are main sources of history and information about our communities. Michael Blackman notes later that community journalism "shaped us, steeled us, pointed us, gave us wing, and reined us in." Texas's editors, journalists, and their newspapers were trailblazers in numerous ways. They have traveled far since the first newspaper, Gaceta de Texas , was launched in 1813. Texas newspapers often took the first step with new technology. Texas newspapers made use of the newfangled telegraph service after it arrived in the early 1850s. For the first time, news of the world did not have to come by mail toted on horseback or rail. Texas newspapers also have a long association with the Associated Press. The AP hit Texas sometime about 1884, after being founded in New York City in 1848. It's doubtful that those money-saving big-city publishers who organized the wire service dreamed it would one day be the world's largest news-gathering organization. Community newspapers in Texas were the first in the country to make widespread use of offset printing, combining that process into centralized printing facilities. They were the first to make widespread use of "cold" type, abandoning the long-serving Linotype machines and their hot slugs of metal. Much of the credit for the change in technology and the concept of centralized printing facilities goes to the late Staley McBrayer of Fort Worth, an owner of North Texas community newspapers who in the mid-1950s pioneered the development of an affordable web-offset newspaper printing press, the Vanguard, that met the needs of smaller publications. When the personal computer arrived on the scene, community newspapers jumped at the opportunity to take advantage of that technology. Although slow to initiate the use of costly pagination systems—lower labor costs offset the price of expensive computer software—community newspapers are now often even with or ahead of the major metropolitan newspapers when it comes to technology. Virtually all have taken advantage of the Internet and can now deliver news and advertising worldwide. Newspapers from the beginning have shown their interest in fighting for their communities, for what is right. In fact, some have even been involved in fisticuffs: community newspapers personify personal journalism. An oftentold story relates how a Panhandle sheriff, displeased at the editorial comments in the weekly paper, showed up at the newspaper office. Discussion led to a fistfight and brawl involving the sheriff and the editor, right there in the newspaper office. Most fighting is done with words, as when newspapers press governmental officers and agencies to provide information the public has a right to know, or when they support or oppose some project facing the community. Most fight for economic development as well because advertising revenues keep newspapers solvent. Generally, newspapers tend to stay close to home with their concerns. But at least twice during TPA's existence newspapers from across the state banded together in common cause. During the Great Depression, Texas newspapers were credited with helping successfully stage the Texas Centennial Exposition in Dallas. It was a combined effort to blend business with patriotism, as Newsweek described it. Centennial editions of newspapers brought in badly needed revenue, and the centennial itself helped draw investment capital from afar while introducing Texas to businesses and people unfamiliar with the state. As Patrick Cox notes in this book, the centennial helped redefine the state's character and its institutional memory. More important in the eyes of journalists was the concerted effort to gain access to government information in Texas. Texas newspapers played a significant role in gaining legislation to create the first Open Meetings Act and the Open Records Act in 1973. The time was right: a scandal had struck at the heart of the banking industry, its lobbyists, and high-ranking state officials two years earlier. Voters were angry and embarrassed about what was going on in the state capital. The speaker of the house went to jail, and the lieutenant governor was ousted after one term. And at last, Texas had a semblance of laws dealing with public information and records, after similar legislation had been passed at the federal level and by many other states. The Texas Press Association and the Texas Daily Newspaper Association received most of the credit for ensuring passage of legislation to open the doors of state and local government activities. Meeting behind closed doors, at secret locations, or at unannounced times by county commissioners, school boards, or city councils—as well as state bodies—would no longer be allowed or tolerated by law. The TPA and the press in general today maintain a vigil against efforts in most sessions of the legislature to restrict access to government at all levels. All of the foregoing may paint a very serious picture of Texas journalism. But that's not the whole truth. Texas newspapers boast of a cadre of top-flight humor writers. As Jack Loftis, editor emeritus of the Houston Chronicle , notes, humorous prose "is perhaps the best defense available to counter the totally incorrect charge that newspapers are only interested in gloom and doom 'because they sell papers.'" Some of us grew up reading columns from the likes of the late Morris Frank and Paul Crume. But a later generation has been taught to laugh at life—and sometimes to deal with serious issues—by John Kelso, Leon Hale, Mickey Herskowitz, Blackie Sherrod, and Molly Ivins. But look at some smaller newspapers and you'll find humor in very brief takes, often countering life's personal tribulations. Regardless, these efforts draw readers like bees to honey. Although much progress has been noted in Texas community journalism, some changes have come slowly, for example, greater opportunities for women in running our state's newspapers. With World War II, women became more than bookkeepers or society writers. When the men went off to war, the women left behind had to assume new responsibilities. Newsrooms have not been the same since. However, women have been less likely to attain the position of editor or publisher, and women hold those key spots at lower percentages than they fill executive positions in other industries. But take heart. The Texas Press Association had back-to-back women presidents in 2004 and 2005. That's a first. As far back as the TPA convention in 1893, Julia Truitt Bishop of Austin discussed the role of women in journalism: "While women are, perhaps, not practical enough to meet the demands of modern newspapers, they have brought to those newspapers something they sadly needed—a touch of heartfelt tenderness to the hard utilitarianism of the age." Looking at the content of today's newspapers, where the news is more featurized and stories on virtually every topic are visible, Mrs. Bishop was right on target. Newspapers in Texas have served their communities well. if an area needs a new hospital, they are in there pitching. If reform is needed in government, newspapers are there to point out the problems and talk to people with solutions. As Mike Blackman points out, Texas is different, primarily because from the beginning, newspapers "recorded the whole shebang: the good, bad, and prickly-pear ugly." He also points out, "We are what we read. And for that you may thank your local newspaper as well as its loyal and sustaining companion, the Texas Press Association." May the TPA mark its 250th anniversary.